Mara Brock Akil On Playing 'The Game' In Hollywood One of the most powerful writers and producers in Hollywood is black, female, middle-aged and Muslim. 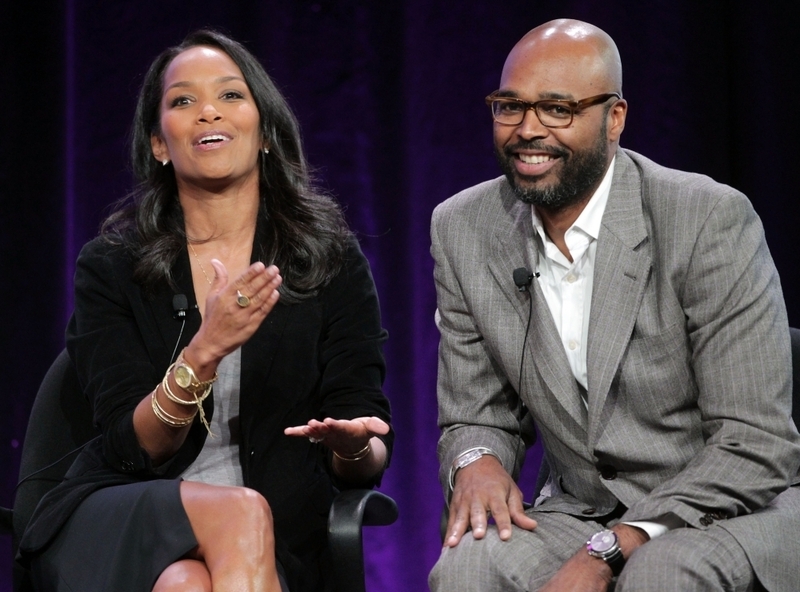 Along with her husband, Mara Brock Akil produces The Game -- one of the biggest hits on cable TV. Last year, the couple collaborated on the comedy-drama film Jumping the Broom. Formerly a writer for Moesha and The Jamie Foxx Show, Mara Brock Akil is (with husband Salim Akil) part of the power couple behind BET's hit comic drama The Game. Mara Brock Akil is a Hollywood rarity. Black, Muslim, and a mother of two, she's also one of the most powerful women in Hollywood and one-half of an industry power couple, along with her director husband, Salim Akil. Akil created The Game, one of the most popular shows on cable television. It's a comedy-drama about the wives and girlfriends behind a pro football team. It's her second show — the first was Girlfriends, which aired on UPN, then The CW network for eight years. Akil started working in television soon after graduating from Northwestern university. It's a male-dominated business, and it wasn't long before she realized her fellow writers were missing something. "I started by like — 'Well, I don't think a woman would say that.' You know?" she remembers from her Los Angeles production office, her 7-year-old son playing in the next room. "I don't think that's really our experience, or it's not every woman's experience. Then I was like ... 'Hey, wait a minute, where is a black woman in this story?!'" Black women are the heart of The Game. Melanie, the main character, is a medical student (later a doctor) at the beginning of the series. Her boyfriend (later husband) is a rookie who needs her to get along with a smug sorority of football wives in order to advance his career. "Isn't your man a third-string wide receiver?" sniffs one of them during their first introduction. "Why are you even talking?" The Game revels in the glamour and immense wealth enjoyed by sports heroes, but its story arcs focus on families, the game's intense physical danger and pro football's stew of race and class. "I hit the stereotypes dead on," says Akil, with some satisfaction. "The stereotype of a lot of athletes are, they come from the ghettos, they buy their mamas a house, they're loud and audacious." Tia Mowry Hardrict plays Melanie, a doctor whose husband Derwin is a rookie NFL player for the San Diego Sabers. Akil says her goal for The Game was to create relatable characters. While that does describe Malik, the team's star quarterback and his bossy mother/manager, Akil says her mission is to create relatable human characters, not cartoons. And she mixes in topical issues, like the closeted gay player who horrifies much of his team when he comes out. The Game aired on The CW for three seasons, then was summarily canceled. "It was humbling for me," Akil admits. "I'm a winner. ... Meaning even if it doesn't look like I'm winning, I believe I'm winning. But that time it was kind of tough." But then something happened that almost never happens: BET picked up The Game in 2010, and the fourth season's premiere drew almost 8 million people --a record for the network, and impressive numbers for any channel. "That outdraws most of the regular-run programming on NBC on any night," comments Time magazine critic James Poniewozik. "Excepting maybe football. Maybe it helps that The Game has football involved in it — although that didn't help Friday Night Lights." The Game is no critical darling like Friday Night Lights, but it brings perspectives and points of view not often seen in TV or mainstream film. And the Akils are slowly conquering both mediums. They surprised many in Hollywood last year with a hit movie, Jumping The Broom. So far, none of the characters created by Mara Brock Akil share her Muslim faith. "It has to be right the moment, the right character at the right time," she says. "And I do think we're coming close." And they've signed a long-term development deal with BET that might include a show about black women and marriage. Akil says there's a powerful conversation to have about that topic — and she says TV is a powerful way for her to lead it.